More than 29.5 million Americans suffer from migraine, with women being affected three times more often than men. This vascular headache is most commonly experienced between the ages of 15 and 55, and 70% to 80% of sufferers have a family history of migraine. 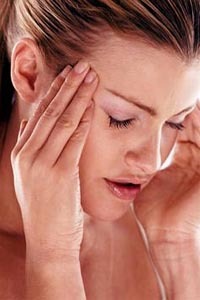 Migraine is often misdiagnosed as sinus headache or tension-type headache. The pain of a migraine headache is often described as an intense pulsing or throbbing pain in one area of the head. It is often accompanied by extreme sensitivity to light and sound, nausea, and vomiting. Migraine is three times more common in women than in men. Some individuals can predict the onset of a migraine because it is preceded by an "aura," visual disturbances that appear as flashing lights, zig-zag lines or a temporary loss of vision. People with migraine tend to have recurring attacks triggered by a lack of food or sleep, exposure to light or hormonal irregularities (only in women). Anxiety, stress, or relaxation after stress can also be triggers. For many years, scientists believed that migraines were linked to the dilation and constriction of blood vessels in the head. Investigators now believe that migraine is caused by inherited abnormalities in genes that control the activities of certain cell populations in the brain. The pain of migraine occurs when excited brain cells trigger the trigeminal nerve to release chemicals that irritate and cause swelling of blood vessels on the surface of the brain. These swollen blood vessels send pain signals to the brainstem, an area of the brain that processes pain information. The pain of migraine is a "referred" pain that is typically felt around the eye or temple area. Pain can also occur in the face, sinus, and jaw or neck area. Once the attack is full-blown, many people will be sensitive to anything touching their head. Migraine pain is often described as throbbing or pulsating pain that is intensified by routine physical activity, coughing, straining, or lowering the head. The headache is often so severe that it interferes with daily activity and may awaken the person. The attack is debilitating, and migraine sufferers are often left feeling tired and weak once the headache has passed. Tests such as the CT scan and MRI are useful to confirm the lack of organic causes for the headaches. There is currently no test to confirm the diagnosis of migraine. A migraine typically begins in a specific area on one side of the head, then spreads and builds in intensity over 1 to 2 hours and then gradually subsides. It can last up to 24 hours, and in some cases, several days. There may be accompanying symptoms such as nausea, vomiting, sensitivity to light (photophobia), or sensitivity to sound (phonophobia). Hands and feet may feel cold and sweaty and unusual odors may be intolerable. For Adults 18 yrs or above, two (2) Capsules twice daily (every 12 hours) in empty stomach with lukewarm water. Please give minimum 30 min to take any food after taking MIGTRIM. Take optimum water to enhance elimination of released toxins from the body. I have been a migraine sufferer all my life. I am a 40 yr old woman and I get horrible debilitating migraines several times a week. When they come on, it is almost impossible for me to function at all and I am highly sensitive to light. My vision even becomes impaired and they are often accompanied by vomiting. My doctor has given me many migraine medications but they just don't help at all. I don't normally buy off the internet but I was at the end of my rope. I did an internet search on natural herbal migraine products and your site came up. It was really a blessing. I ordered one bottle of MIGTRIM after your recommendation. I started using it with some doubt I have to admit but I was amazed at the results. After all these years, I did not get one more migraine attack after the day. I contacted one of your herbalist to find out how long I would need to use it before stopping and being assured that the migraines would not return. He suggested using MIGTRIM for a minimum period of 18 months. For the last five months I have been using MIGTRIM have not had even a single migraine. I recommend MIGTRIM highly to anyone who knows how bad severe migraines are. It is an amazing product. In my opinion, the only one that works. I am an 18 year old college student. I just began to experience extremely painful vascular headaches since entering school. Every time I get one it leads to vomiting. It makes school work much more difficult because it's affecting my vision too. I was surfing the internet and found MIGTRIM. I placed an order for one bottle because at this point I needed to find something fast. After using MIGTRIM my migraines are completely gone. My school work has improved significantly and my quality of life is definitely better. I am still using MIGTRIM, as the company herbalist advised. Thank God for this product. I have avoided ending up in a hospital and haven't had to resort to chemical medications. No healing crisis or side effects are noticed. Result within 30 days or Money Back, Guaranteed !!! WARNING :- This traditional herbal food supplement is derived and time tested by Chavarcode Ayurvedic physicians. Results may vary among users. These statements have not been evaluated by the FDA. Products featured here are not intended to diagnose, cure, prevent or treat any diseases and should not substitute treatment by a registered medical practitioner. We do not claim that the products or dietary supplements mentioned can protect you from developing serious diseases and recommend that you never delay or forego regular screening, or forfeit the opportunity for early medical treatment that may be critical to survival. You are advised never to self-treat for a serious disease without benefit of a medical diagnosis or treatment. Please consult your physician before beginning any course of treatment.